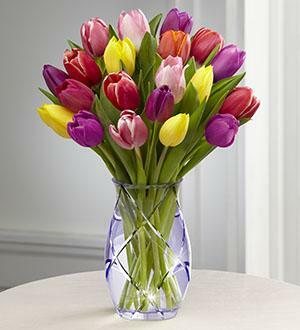 BETTER Homes and Gardens® Spring Tulip Bouquet. 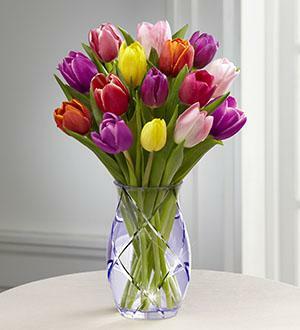 This gorgeous arrangement of tulips is the perfect way to celebrate the arrival of the spring months! 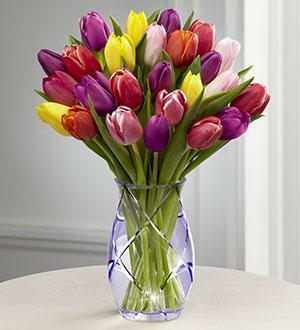 An assortment of tulips in a stunning array of colors, including red, yellow, purple and pink, are brought together to form an impressive and eye-catching bouquet. Presented in a designer etched lavender glass vase, this flower arrangement is a wonderful gift to send your happy birthday wishes, offer your congratulations or to say thank you throughout the spring months ahead. GOOD bouquet includes 15 stems. Approximately 14"H x 9"W.
BETTER bouquet includes 20 stems. Approximately 15"H x 10"W.
BEST bouquet includes 25 stems. Approximately 15"H x 11"W.